This debut novel written by Jodi Meadows is a well balanced mixture of dystopian meets paranormal, with a sizzling dose of romance poured in. The action starts from the first few pages and doesn't let up until you've closed the final chapter, yet leaving you with a burning for more. In the beginning we learn that Ana is considered a newsoul, meaning she is the first of her kind. In a world full of people who have been reincarnated for thousands of years, Ana is on a mission to discover the whereabouts of her origin and what it all means. Along this journey she meets Sam, a boy who appears to be her age, yet has the experience of a soul who has lived hundreds of decades. Though Ana is reluctant, with her guard held high, something inside her tells her to trust Sam and accept his help in her quest. The two take on the city of Heart, the birthing grounds for where this all began. Inside the walls of Heart Ana begins to uncover the truth about newsouls and the harshness of what it feels like to be considered different from every other living soul. This world that Jodi Meadows created about reincarnation fascinated me. The ability to live multiple lives over and over again, and still remembering your past life, was very intriguing. I loved the bit about soulmates as well; how true love would find each other in every new life, regardless of what body you inhabited. The relationship that slowly simmered between Ana and Sam was another favorite aspect of the story. Their connection was prominent from their first meeting, but the bond they slowly formed through trusting one another is what won me over. Sam's way with music and how he taught Ana the beauty of it captured my attention. The soft moments of almost touching, stealing glances, and heavy tension that hung in the air kept me turning the pages, eager to find that climatic moment. I am very impressed with the writing in this debut novel. I have high hopes for this author's future work and am eager to continue this series. Though the story ended with questions hanging in the air, it does not pose a cliffhanger threat. Jodi Meadows fed my hunger just enough to be satisfied, yet left my stomach grumbling for just one more bite. I love it when books are just good enough to leave you wanting for more, but not so desperate that you're dying inside for the next installment. This looks like a good investment to put on my new NOOK when I get it next month. I Have this one waiting for me and really need to read it NOW! The reincarnation aspect really intrigues me. I've hear some good things about this book. Will check it out. I love that you can put a fresh spin on this book that I've read at least 15 reviews on. Your closing sentence is divine. The end. I just read the synopsis for this the other day and I thought it held promise. Glad to hear you enjoyed it! This book sounds really good, and I love the cover! Sounds like a great debut! The only thing I'm worried about is the romance. Call me a bitter cynic, but the idea of soul mates isn't really my thing. 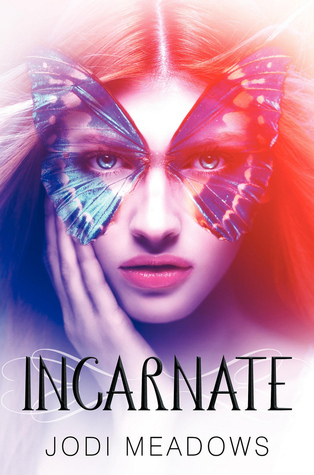 Still, I have to admit Incarnate intrigues me! It sounds very interesting and unique. I'm a bit iffy about buying it 'cause I'm very iffy about butterflies - childhood scares... - but I think I might just buy the kindle version so I don't have to deal with the cover. Anyway, thanks for the review. I had passed on this book but now it's back on the shopping list. I'm really excited about getting the opportunity to read this one, because it just sounds SO good. And the cover is absolutely gorgeous! SAAAAAAAAM SAM SAM SAM SAM!!! Great review!! I am so excited for this book. I have it pre-ordered and can't wait to read it. I have an eARC of this on my Kindle and whenever I read a review for this, I want to start reading it immediately. It sounds like such a unique story and since I love everything reincarnation-themed, I'm sure I'll like this, too. Thanks for sharing your opinion with us. Great review! I really enjoyed this one as well! The writing was really good and the romance between Sam and Ana was sweet. I'm interested to see what happens in the next book. Great review!